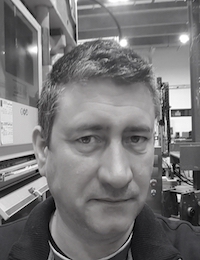 Patrick is currently involved in improving lab infrastructure and test procedure design, to streamline testing of full-scale composite wind and tidal turbine blades. Patrick initially trained in a technical college (MSW) in Switzerland, before embarking on a marine centred career involving Marine Biology (BSc.UCC), Physical Oceanography (BSc.NUIG) and Mechanical Engineering (BEng.GMIT). The latter was carried out during full time employment as Technical Project manager for Marine Technical Development Services and later P&O Maritime Services, whose primary functions were/are the technical and scientific support for the Irish Marine Research Fleet, This included vessel modifications, and the deployment of subsea platforms, weather buoys and Ocean Energy Platforms. Patrick later became more directly involved in the sustainable and renewable energy fields, while working for Marine Technology Ltd; developing WEC prototypes for Sea Power Ltd and other developers, combustion chemistry equipment such as Rapid Compression Machines and High-Pressure Shock tubes for scientific clients worldwide, and numerous subsea applications. Patrick later joined the Combustion Chemistry Group (C3) in NUIG, prior to commencing employment in the Structures Research Lab.